Cloud usage and spend are expected to grow dramatically in the coming years as more organizations move to the cloud. If you’re already in the cloud, or you’re thinking of elevating your business to it, it’s vital that you’re able to effectively monitor and manage your cloud billing, spend and usage. OnSpend by Onix™, a billing analytics tool, empowers you to efficiently and effectively manage the budget and billing processes associated with your Google Cloud Platform (GCP) accounts and projects by visualizing your GCP usage and equating that usage to cost. You get an accurate visual representation of your GCP usage and spend across all of your accounts and projects. With the ability to set custom date ranges to view both usage and spend metrics on a daily or cumulative basis, you are in control of your GCP budgets. 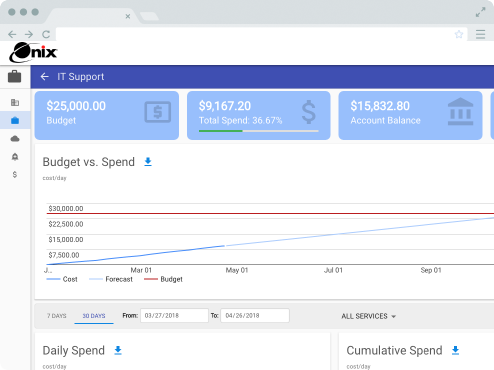 OnSpend allows you to create budgets at multiple levels and track your GCP spend against any given budget. Unlike the Google Cloud Console, OnSpend tracks your budget past 30 days or gives you the option to set your time frame to reflect the duration of your purchase order. It also supports multiple purchase orders to make yearly budgeting easier. You can use OnSpend’s forecast feature to understand your future GCP spend based on past spending behaviors and patterns. This tool also gives you the intelligence to predict a budget's completion, which is determined by previous daily spend averages. It also allows the cloud billing administrator to set date ranges for customized analysis. The alert feature provides notifications for critical events related to a project at risk of a budget overrun. You can choose to receive notifications on a daily, weekly, monthly or purchase order basis. Understand how your organization consumes Google Cloud Platform services. See GCP-related spending over long periods of time. Organize information at the cloud billing account and project level. Efficiently manage multiple projects at once. Use past spending data to budget more accurately for future usage and spend.